October's Students of the Month are Zoë Hay and Michaela Acherman. 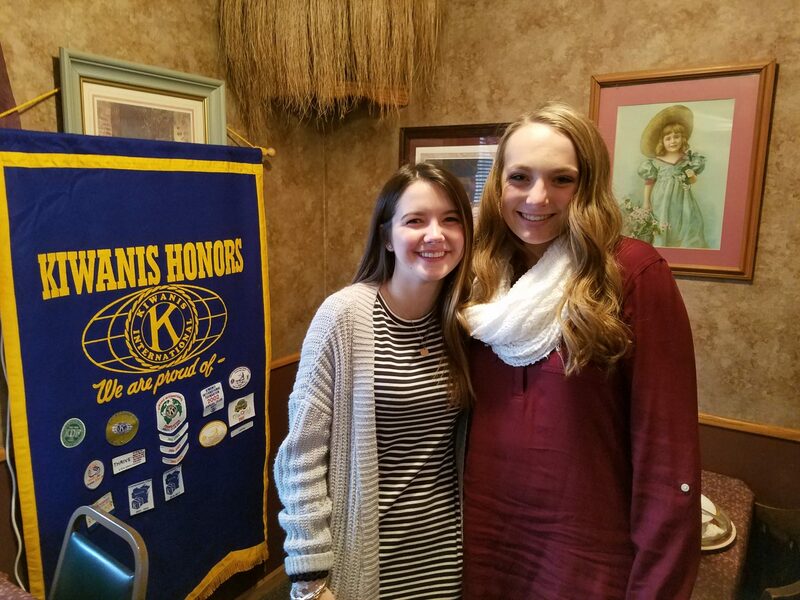 The Mineral Point Kiwanis Club honored its October Students of the Month at its meeting Tuesday, October 2 at the Pointer Cafe. These are the first Students of the Month for the 2018-19 school year. Michaela’s family has been extremely supportive of her in pursuing her goals and dreams. Michaela’s parents, Mark and Stephanie Acherman, are both teachers at Darlington Elementary/Middle School. They are not only wonderful school teachers, but also the best life teachers. She has two brothers Bryce, who is a freshman, and Reid who is a sixth grader. She would like to thank her family for all of their love and guidance over the years. Michaela’s favorite hobbies throughout high school have been participating in the musicals, band, and choir, and cheerleading. She has also enjoyed being in forensics, FBLA, Key Club, and Book Club. Outside of school, Michaela enjoys baking, hunting, working out, and spending time with her family and friends. On Sundays, she enjoys teaching music and helping out with the Sunday School at the United Methodist Church. Throughout her high school career, she has babysat for multiple families. She loves kids and being a positive influence on them. Michaela is planning on attending the University of Wisconsin-Platteville or the University of Wisconsin-La Crosse. She is planning on going into either elementary education or dietetics. Michaela would like to give a special thank you to two teachers who have helped her throughout her high school career. Mrs. Cindi Nothem and Mr. Tom Steger are always there to support her with extra help, a listening ear, and to offer advice. She would like to congratulate Zoë, who is so deserving of this honor. She would also like to thank Kiwanis and her school for choosing her as a Student of the Month. Finally, she would like to thank her family, church, and community for shaping her into the person she is today. Loved more than you know. Zoë Hay is the daughter of Don and Lisa Hay. She was born in Chicago, Illinois and moved to Mineral Point in 2007 just before starting first grade. She has a 28-year-old brother named Zack who currently lives in Austin, Texas. She has a poodle named Daizy and two cats named Gordon Whitefoot and Night Sky. She really cannot believe that she is a senior and that next year she will be in college. During high school, Zoë has participated in Key Club, Future Business Leaders of America, Forensics, Mock Trial, and Student Government. She is a member of the National Honor Society and teaches English to native Spanish-speakers. Zoë enjoys skiing, traveling, hiking, and photography. Zoë has worked at High Street Sweets since it opened. Zoë has spent much of her recent free time writing college applications. At this point, it seems like a hobby. Zoë currently does not know where she will be attending college. It could be anywhere. She does not know what she wants to study but knows it will be something to do with languages, history, math, chemistry, or international relations. Given her uncertainty, she plans to attend a liberal arts college. Zoë would like to thank all of her teachers not only for what they taught her but for being so supportive over the years. Zoë would like to give a special thank you to Lifka Bennett for encouraging her to be the best student she could be and to Di Sterba for instilling an early love of Spanish in her. She would like to congratulate Michaela Acherman for also being honored as Student of the Month. Zoë thanks her teachers for selecting her and Michaela, and the Kiwanis for honoring them. She would finally like to thank her parents for their love and support.